"I'm just beside myself. I have no idea what happened in that operating room," Tasha Gaul says of her son. (CNN) -- Early one morning in April, Tasha Gaul and Dale Matlock took their young son, Jesse, to a hospital in Portland, Oregon, for surgery to correct his lazy eye. It was supposed to be an easy procedure: Jesse, who was 3 at the time, wouldn't even have to spend the night at the hospital. The surgery was indeed quick and simple. The problem was, it was on the wrong eye. Gaul says she remembers what the surgeon, Dr. Shawn Goodman, said to her as she exited the operating room. According to Gaul, Goodman told her, "Frankly, I lost my sense of direction, and by the time I realized it was the left eye, I was almost done." Gaul claims that after Goodman realized her mistake, she performed the surgery on the correct eye. In a statement to CNN, Goodman's office, Child Eye Care Associates, wrote that she cares very much about all of her patients and wants only the best for them. Because of patient confidentiality (HIPAA), she cannot talk about any patient to the public, the statement said. I'm just beside myself. I have no idea what happened in that operating room," said Gaul, who'd been taking her son to Goodman for two years before the surgery. Gaul and her fiancé have contacted Portland attorney Chuck Paulson and plan to sue. "I feel like we had a right to know the second she realized she was in the wrong eye," Gaul said. "She went into the wrong eye first, and that's why we make a big deal about this." Harmed in the hospital: Should you sue? According to a 2006 study looking at the frequency of surgical errors in the United States, each year there could be as many as 2,700 mistakes where a surgery is performed on the wrong body part or the wrong patient. That's about seven per day. Goodman works in her own private practice but has hospital privileges at Legacy Emanuel Medical Center, where Jesse Matlock underwent surgery. In a statement, Legacy says, "we are working with our operating room staff, and with the private practice physicians who were involved, to identify what happened so we can prevent it from happening again." "Not another one." That's the first thought that went through Dr. Kenneth Kizer's head when he learned of what happened to Jesse Matlock. "It's serious, it's preventable, and it should never happen," he said. Kizer is the former CEO of the safety advocacy group National Quality Forum and the man who helped coin the term "never events," a list of 28 adverse events -- such as operating on the wrong body part or giving a patient the wrong medication -- that happen in the health care system and put patients at serious risk. He says efforts to prevent these types of surgical errors have gotten better over the past decade, but there is still room for improvement. "People underestimate how complex the system is and the number of ways that errors can happen," he said. "There are dozens of doctors that will be involved in a case that goes to an operating room. Every time someone new sees a patient, there's the potential that they'll miss something or get a detail wrong." Patient safety advocates suggest that hospitals use a checklist. The American Academy of Ophthalmology, for example, has a task force focused on patient safety and provides a checklist of recommendations that physicians should follow before, during and after an procedure on the eye to prevent wrong-site surgeries. But, sometimes it doesn't happen. "The checklist process is good, and people have adopted it better than expected, but there are limitations," said Dr. Samuel Seiden, an anesthesiologist and co-author of the 2006 study on surgical errors. "The systems we have in place prevent a lot of these kinds of mistakes, but not all of them." For instance, Dr. Michael Repka, a spokesman for the American Academy of Ophthalmology, says it is possible for a mark to be covered up by surgical draping. He also says, "if the skin prep is particularly thorough, the indelible ink (used to mark surgical sights) can become less visible. You don't get rid of it completely, but some of it can come off." Experts say even the best doctors can make mistakes. According to Repka, it is possible for eye surgeons to become disoriented because they're used to examining a patient from in seated position -- a different angle from the operating table. He says ophthalmologists are aware of this, which is why they take preoperative protocol very seriously. 1. Ask, "What are you going to do to ensure that you don't operate on the wrong site?" Kizer says that asking this question explicitly puts the concern on the doctor's radar. "Patients have to be aggressive sometimes," Kizer said. Also, if someone new is seeing you, this question may help to remind them to review your records and clarify one more time. 2. Request a "time-out" just before anesthesia. The Joint Commission's Universal Protocol recommends that the operative team take what is called a time-out right before surgery. That's a time when all relevant members of the surgical team stop and communicate to ensure they are all in agreement on what's about to happen. Diane Pinakiewicz, president of the National Patient Safety Foundation, says patients should consider themselves critical members of the health-care team. "Patient involvement is one of the keys. It's imperative that they be proactive," she said. Pinakiewicz suggests that before going under anesthesia, the patient or the patient's caregiver should not be shy about requesting a time-out or asking the head of the surgical team whether they have taken one. 3. Say: "My name is John Smith, and my birthday is January 21, 1976." Patient advocates say to make sure your name is double- and triple-checked and that prior to surgery, whether you're speaking with the surgeon, the anesthetist or the nurse, make sure everyone involved in your care knows exactly who you are. My colleague, CNN's senior medical correspondent, Elizabeth Cohen, advises that if your name really is John Smith, you should also include your middle name. Don't underestimate the fact that patients in the same hospital may have similar names with slightly different spellings. Stating your full name and birthday can help ensure that you aren't confused with another patient. 4. Don't rush through the informed consent form. Before having surgery, patients fill out a consent form, which details what specifically is being done and the possible risks and complications. Kizer says sometimes patients glaze over the details because they don't like to hear about the horrible things that can happen. He says this is a missed opportunity to find potential errors that may have made their way that far. 5. Make sure your doctor initials your site. The American Academy of Orthopaedic Surgeons urges its members to sign their initials directly on the site before surgery. Make sure your surgeon -- not someone else -- does the signing and that it's in the right place. The protocol may vary from hospital to hospital, but the bottom line is that patients should make sure the surgeon clearly marks the proper surgical site before you leave the pre-op area. 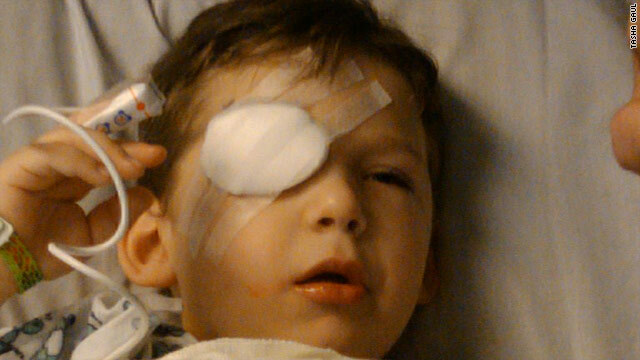 Jesse Matlock's parents said they initially had a bad feeling about how the surgery would go when, on the morning of the procedure, one of the surgical nurses mentioned paperwork that said the little boy would need surgery on one or both eyes. "There'd been no mention of both eyes until then," Gaul said. "I immediately had this feeling of dread." Gaul says her fears were allayed when Goodman, in the presence of other members of the surgical team, indicated the proper incision site by drawing several marks, including one about the size of a quarter on the skin above Jesse's right eye. According to Gaul, after the surgery, Goodman told her that one of the nurses preparing Jesse's eye may have covered up the mark. The hospital is investigating what went wrong during Jesse's eye surgery. The chief medical officer of Legacy Emanuel Medical Center issued a reminder to its staff immediately after Jesse's operation, informing them of the incident and reminding them of the importance of following appropriate procedures. The family will not be charged for the surgery, and follow-up care with another provider will be provided at no additional cost. "We have a commitment to quality and safety, and we take any failure very seriously," the hospital says. Right now, Jesse's vision is fine, but his mother has noticed a slight lag in his good eye, his left eye, ever since the operation. She says it may be several weeks before they can know for sure. "With any surgery on your child, you're going to be stressed and worried and want to make sure it happens the way it's supposed to because you're there to protect them," she said. "I feel now I have to protect my child from these doctors no matter what. You really can't trust anybody." CNN Senior Medical Correspondent Elizabeth Cohen contributed to this report.